What a won­der­ful time we had in Leices­ter for the week­end of the Street Choirs Fes­ti­val. 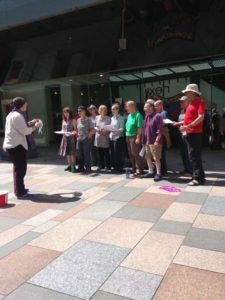 30 choirs, the vast major­i­ty being polit­i­cal­ly engaged, gath­ered for a fab­u­lous con­cert giv­en by local musi­cians and come­di­ans, a great massed sing in Jubileee Square, busk­ing on the streets (includ­ing lusty singing as we strolled past march­ing sol­diers gath­ered for Armed Forces Day), a fan­tas­tic con­cert of all the choirs, and work­shops and a pic­nic the final day. Phew. Exhaust­ing? Yes. Exhil­a­rat­ing? Cer­tain­ly. Inspi­ra­tional? Undoubt­ed­ly — espe­cial­ly as it occurred on the week­end after the momen­tous deci­sion to leave the EU. Won­der­ful to be sur­round­ed by hun­dreds of peo­ple who care pas­sion­ate­ly about sol­i­dar­i­ty and diver­si­ty — the twin themes of the week­end. Many thanks to Shereen and Pen­ny for their bril­liant lead­er­ship. My first time at Street Choirs Fes­ti­val, but def­i­nite­ly not my last! This entry was posted in Street singing, Uncategorized. Bookmark the permalink.